If you haven’t read my article on the dangers of buying your cosmetics from unauthorized third parties, then read it here. Buying and using fake or out of date products can lead to disastrous results as well as being out of pocket. CC Beauty, that also operates as Beauty Cosmo and Platinum Beauty UK is possibly one such vendor that buys from unofficial sources. One of the issues of the grey market is that well-known brands can be sold when the products are either discontinued or are out of date. They are supposed to be destroyed, however, somehow these products find their way back into the retail market via third party distributors, and can also lead to established brands having an unfair bad reputation for their products. “I purchased a beauty box from CC Beauty back in December 2016. It was a one off box for January, they claim to send out high end products that are great value for money but instead I got sent expired, smelly, unusable items. Despite my many attempts to contact them (via email directly from their website and Facebook) my concerns were ignored. Not even an apology or explanation, yet alone a solution. 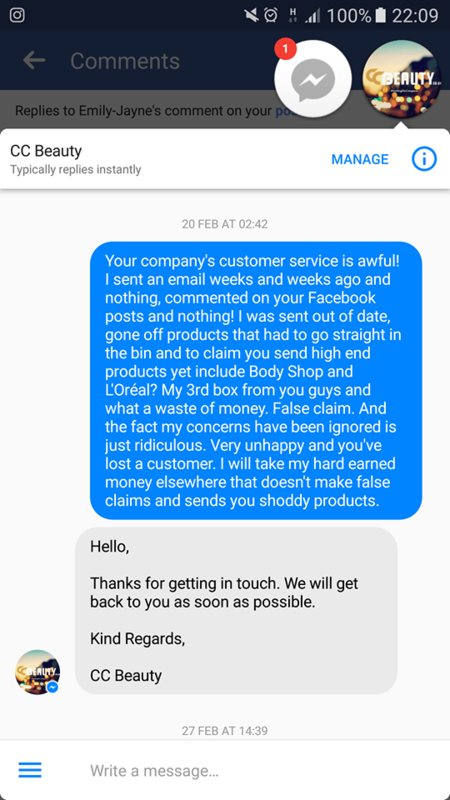 I started commenting on their posts – warning people to check their products and asking why I was sent shoddy items and then ignored when I told them my issues. After many comments on several different posts, I was blocked from commenting anymore, and my previous comments were deleted. I saw other comments on there also stating they had been sent out of date items.” Jayne, from Staffordshire. The box was allegedly worth over £100 (always be careful of these marketing ploys) and included a Too Faced (owned by the Lauder group) lipstick that was damaged; two L’Oreal products (primer and cc cream), a Cargo palette, and a couple of Elemis eye masks. A few of the items had been discontinued or had old packaging, and if that is the case then those products are likely to be a couple of years old, plus there is no certainty of how or where the products have been stored. Some items if stored incorrectly can alter the chemicals in them and can deteriorate faster, and in turn cause reactions on sensitive skin, or even create sensitivity. Currently the March box is being sold as a discounted advertised price of £70 worth of goods for £29.99. However, I checked the same page a week ago and the site claimed the box was worth £113. This is actually misleading and is against trading standard laws, because the box wasn’t sold at that price before. You can only sell items with a crossed out price when that same item (the box and not the accumulated value of the box) was offered at a higher price. 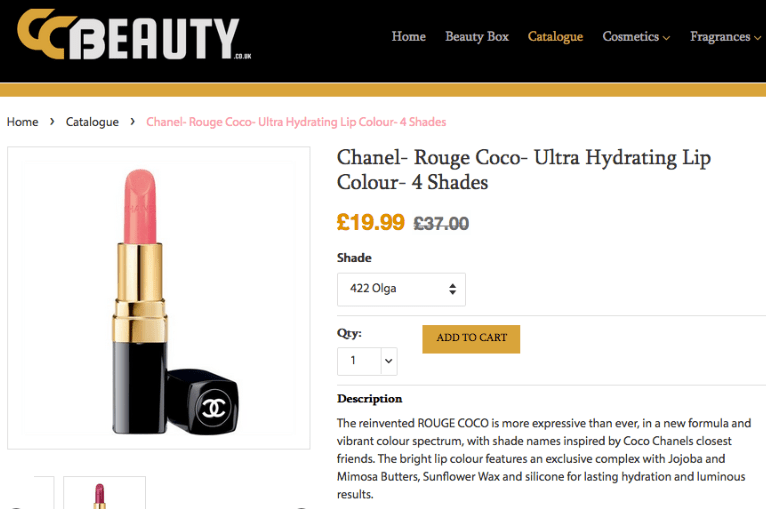 On the website, the RRP on some items are exaggerated; Chanel lipstick is advertised as selling at £37, and they are offering it at £19.99 where the standard price is £28 as on the official Chanel website. 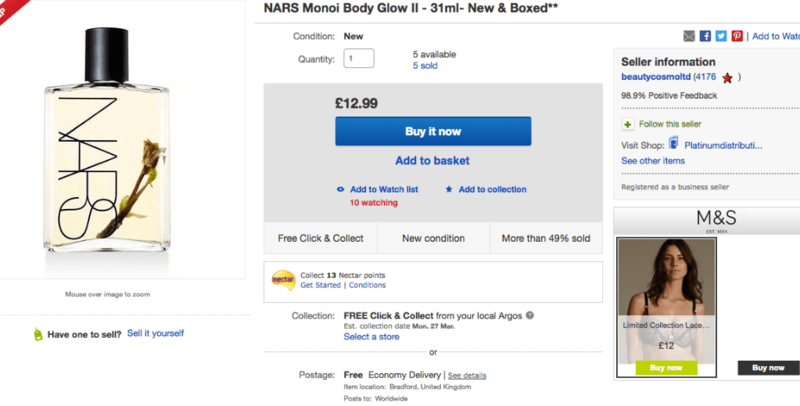 Another product that is misleading is the Nars Monoï Body Glow II 28 ml that is advertised as being worth £45 and they are selling it for £35. 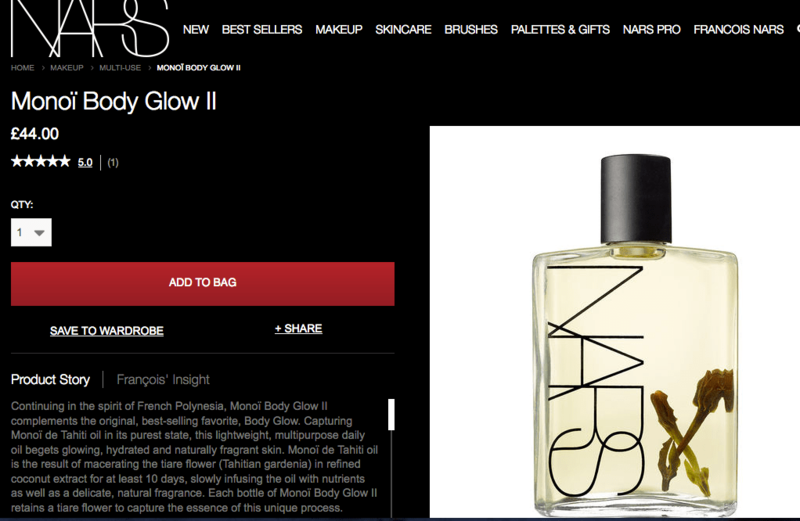 However, that is the RRP for the full sized 75 ml bottle (on the NARS website) and not the travel/sample size which sells on eBay by the same vendor for £13 for the same product. 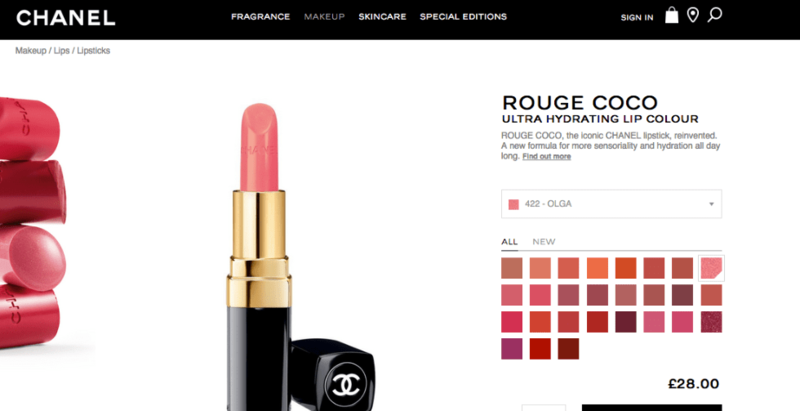 It also looks as if there is copyright infringement where CC Beauty has used the same text from the official NARS website. Same product, same vendor but a £22 difference in price? 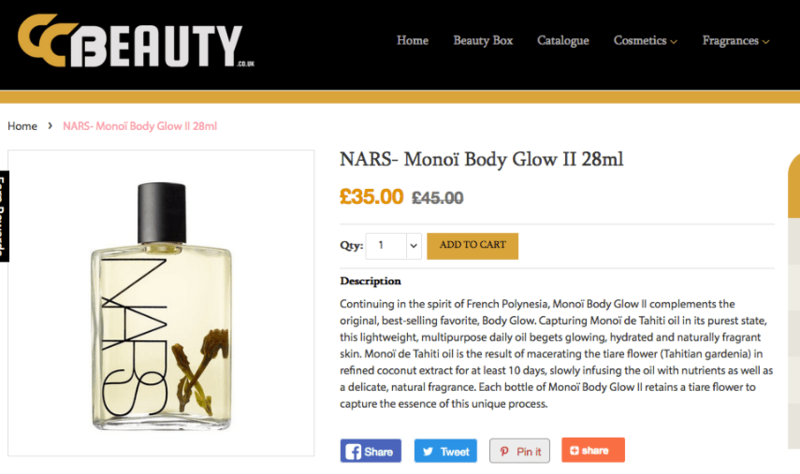 The domain ccbeauty.co.uk was registered February 24 2016, and so it only a year old and has not been trading since 2014 as it claims, but under another name. 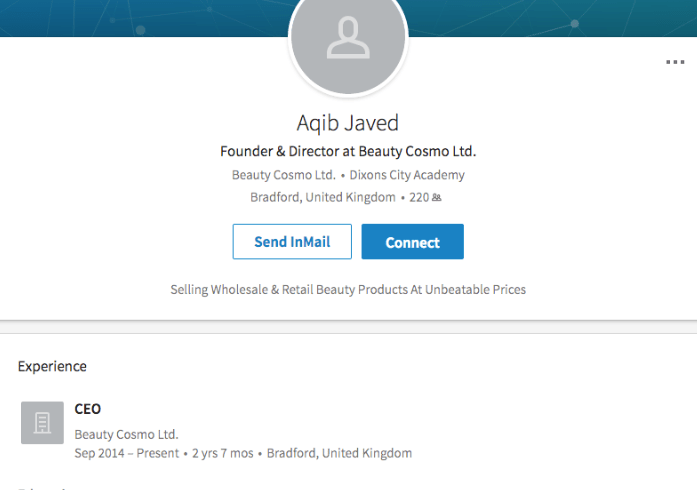 The company is owned by Mohammed Aqib Javed; his previous company Beauty Cosmo Limited was set up in December 2014 and dissolved (compulsory strike off according to Companies House https://beta.companieshouse.gov.uk/company/09335103) in October 2016 at the address: 306 Keighley Road, Bradford, West Yorkshire, England, BD9 4EY. Previously it was listed at 8 Spring Bank until July 2016 and traded via an Amazon store (which now seems closed), and now has an eBay store (also called platinumbeautyuk.com and beautycosmo.co.uk) as well as selling via Etsy (etsy.com/uk/shop/CCBeautyBox) where he uses the name Mohammed Javed. The registered address for returns for the company is: 8 Spring Bank Place Bradford, BD8 7BX, which in turn receives goods from Global Beauty Wholesale (owned by Iltaf Bahadur and used to be called Helena R Luxury Limited April 2015 – Sept 2015) 21 Woodview, Bradford, BD8 7AJ, that is also registered at the first address. Mohammed Aqib Javed also goes by the name Aqib Javed and lists himself as the CEO of Beauty Como Ltd on LinkedIn. 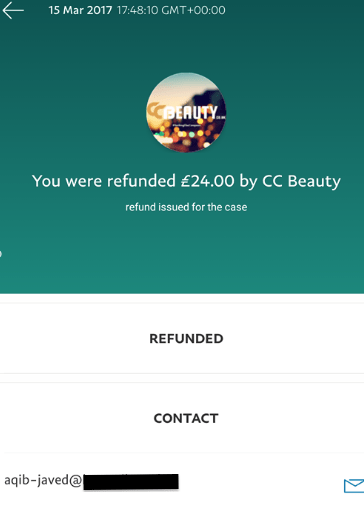 Upon my requesting clarification of the returns policy, CC Beauty refunded Jayne for one beauty box and offered a 20% refund for the damaged item which she hasn’t seen as yet. 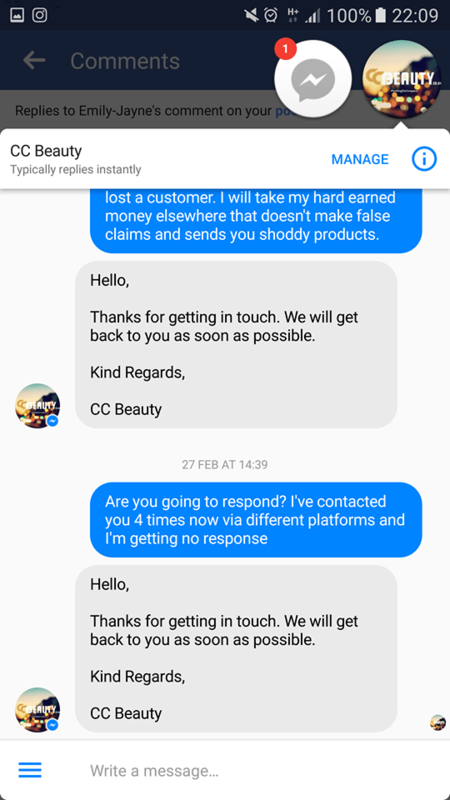 I’m glad Jayne got some of her money back even though it has taken weeks which happened to get refunded on the day they replied to my message (March 15th) asking for a resolution before taking action the under Consumer Rights Act 2015. Her initial complaint was originally sent in January. The bottom line is not to get misled into the marketing ploys of what a beauty box is worth as the prices stated maybe exaggerated or incorrect. Be careful of companies that don’t have a registered company address that isn’t clearly stated on the website. You shouldn’t have to look for it among all the small print if it is a reputable company. Products that look too cheap could be fakes, or if the packaging is old the item maybe out of date. That is another risk with beauty boxes that send mystery full sized items. Finally, do your own checking with independent reviews (check out the reviewer if they are related to the owner, or if they get free boxes to review), and if the items are faulty, return them for a refund. While mystery boxes can’t guarantee what items you will receive, it is against the law to sell faulty or expired items without stating that beforehand they maybe be seconds or substandard. Personally I would only buy from authorized retailers to be on the safe side, and these days with so many offers (loyalty cards, free gifts, and discount days) you can still save money on high end items and be safe. In the long run, trying to save money can lose you money and also end up scarring your skin which no amount of money can repair. Is This The End Of Birchbox Points? I am aware that some readers have been told this is a ‘fake’ review. Jayne wished to share her story and to warn others,but her comments were deleted on Facebook and she was blocked. I asked if she wished to use my blog to share her story and she said yes. This is her tale, and I have backed it up with evidence I have found. The end result is Jayne got a refund after my intervention. Whether the company have learned from this, I do not know. However, everyone has the right to warn others of a bad experience, but others can decide what they wish to do. The relevant companies have been informed in regards to copyright infringement. Well done for getting a resolution for Jayne, a pity it was a stressful and prolonged process for her. This should never be the case when returning faulty goods. 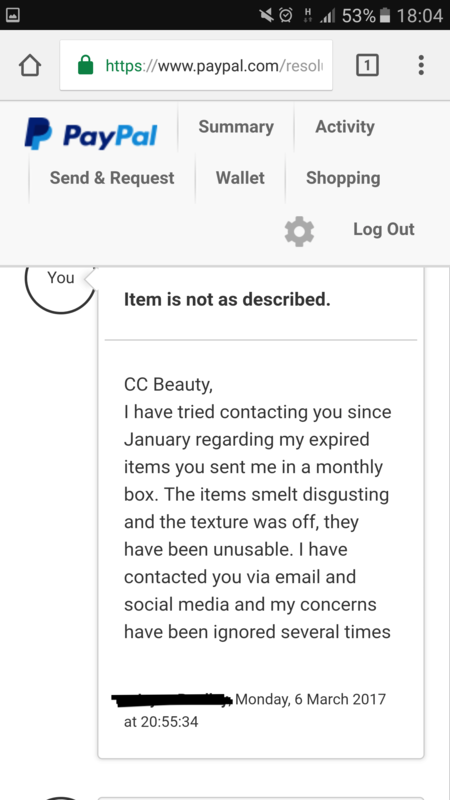 I seriously urge anyone to avoid CC BEAUTY, unless you want expired products, having your emails ignored for months on end and get blocked by them on several platforms cus they try to sweep everything under the rug. Customer service is important, and you are fortunate to have had a good experience. Those who don’t, have a right to share their experience with others as this reader wished to. The point of the article is to highlight buying items from an unauthorized stockist can result in receiving short dated or expired items as was in the case of the reader. Consumers are free to buy whatever they wish, as long as they are aware of this. In the above case, the reader attempted multiple times to contact the company for 6 weeks and got no response; perhaps now they have more staff and have rectified things, but that doesn’t mean that people cannot share their genuine experience.